Paleo Grubs is run by Jess, a food lover and Paleo enthusiast. Jess posts mouth-watering photos of delicious meals, snacks, and desserts that look so good, they can’t possibly be healthy. Except that they are, and she has the recipes to prove it. 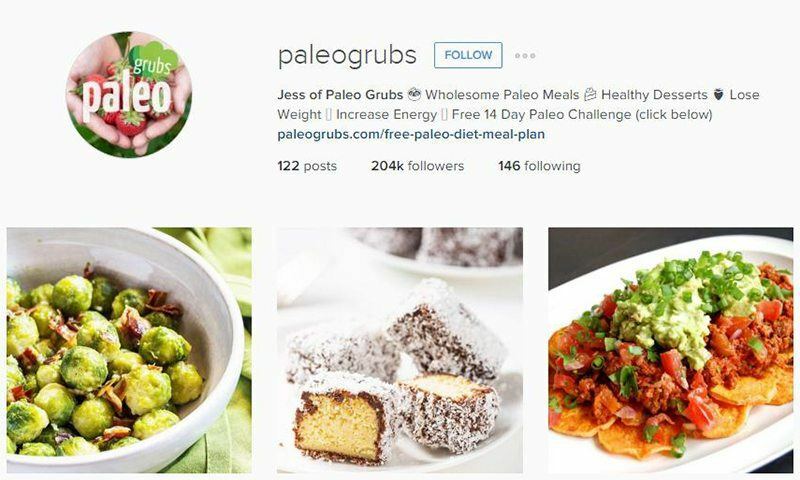 Paleo Grubs has a whopping 201,000 followers, who can’t all be wrong! Stand-out images include: Lamingtons, Parsnip Fries, and Molton Chocolate Lava Cakes. Scrumptious. 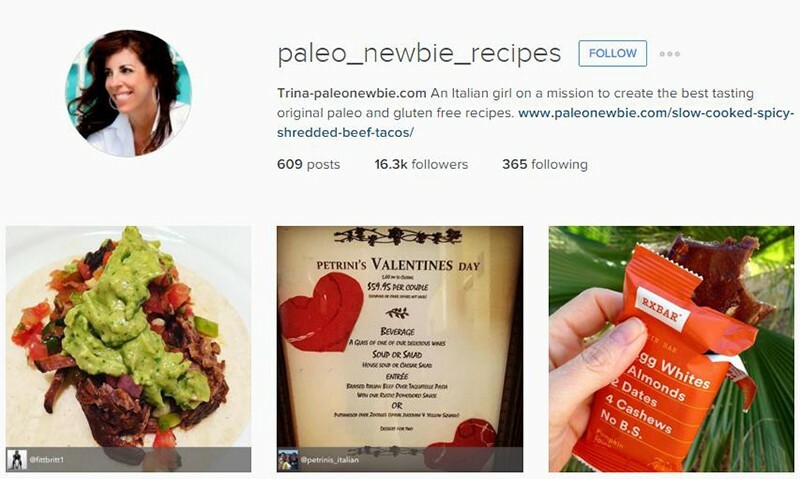 Paleo Newbie is the brainchild of Trina, a no-longer-quite-so-new Paleo eater, who thought that her Italian roots would make Paleo a no-go for her. She was wrong. We know so, because she now creates the most incredible looking paleo foods. Her 200,000 followers think so too. The most tempting photos on her account? It’s difficult to choose, but we love: Turkey Breast with Apple Cranberry Compote, Steak and Eggs with Fried Sweets, and Chocolate Chilli Spice Brownies. Imperfectly Paleo creator, Angela, is no stranger to the effects of food allergies and intolerances and, like so many of us, it took her years of ‘putting up’ before she finally made the break into Paleo life. And she’s never looked back! 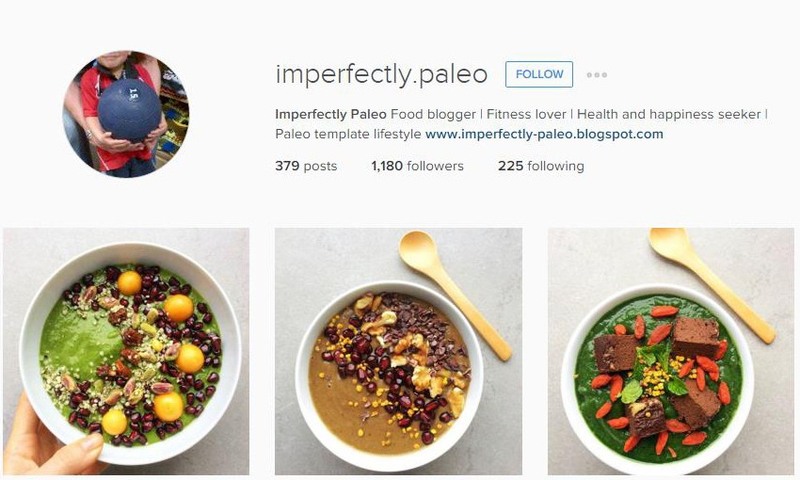 The Imperfectly Paleo Instagram page is all kinds of gorgeousness, with images from her recipes including: Big Green Smoothie Bowl, Courgette Noodles with Coriander, and Raw Black Forest Paleo Cheesecake. Daily Paleo is run by Paleo eaters, for Paleo eaters, and it’s clear from the photos, and their recipe counterparts, that they have your appetite in mind! The Instagram account has over 35,000 followers to share their grain-free, gluten-free, and dairy-free world with, and it’s not hard to see why. Our favorite pics include: Lemon and Coconut Truffles, Lemon Butter Swordfish, Fried Bananas, and Sweet Potato Noodles with Cashew Spinach Sauce. 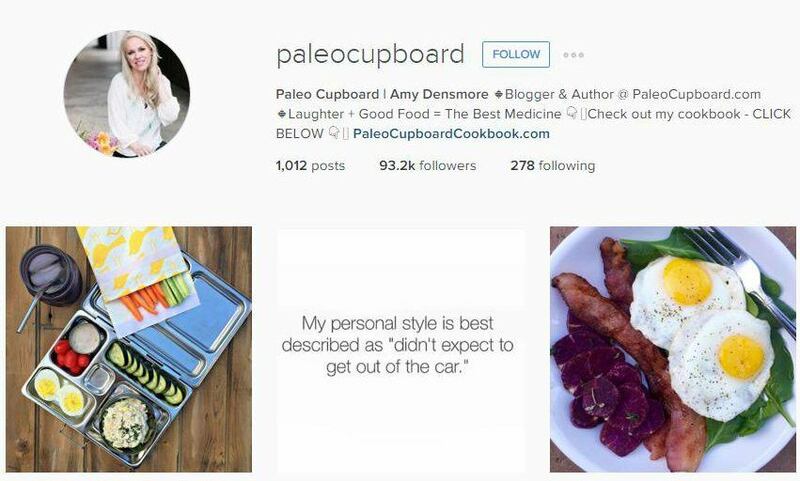 Paleo Cupboard is run by blogger and author Amy Densmore. 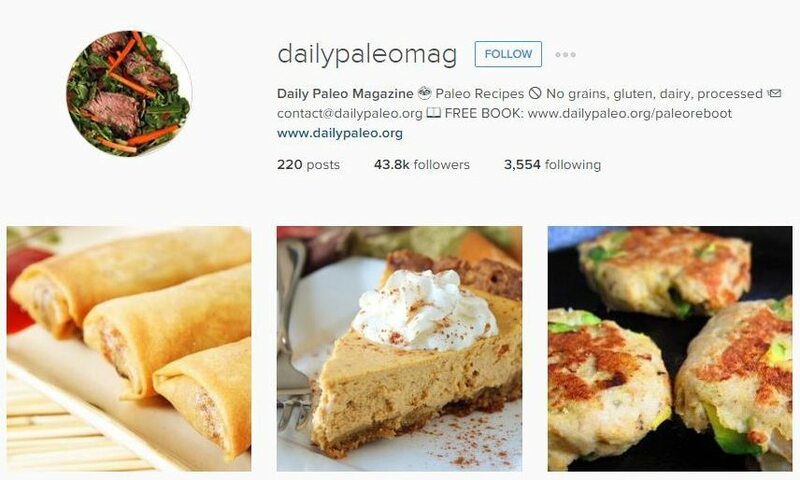 Paleo Cupboard’s followers get a well-proportioned mix of food pics, funny quotes, and the occasional selfie. So this account pretty much has everything! Densmore recently launched her own Paleo cookbook, so there are lots of images of her very own recipes. Our favorite pictures have got to be: Cobb Salad, this unnamed but delicious looking Paleo version of a charcuterie board, this reaffirming ‘Trust me, you’re lovely’ quote, and Calamari. 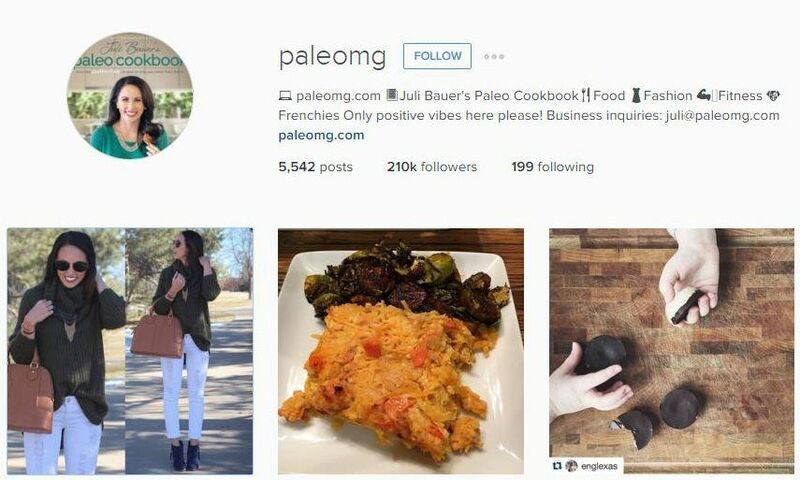 Paleomg is run by Juli Bauer, bestselling author of not one, not two, but THREE paleo cookbooks. Between that, and her 200,000 followers, we were expecting good things. And we weren’t disappointed. 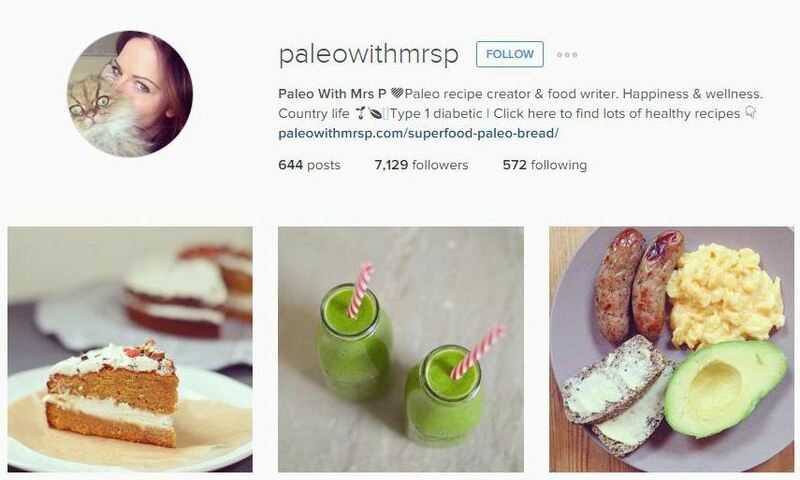 Paleomg’s Instagram account is full of mouth-watering foodie pics, some fun selfies, and the occasional super-cute dog pic. It’s hard to choose which images we love the most, but we’ll give it a go: this four-cakes-in-one-image pic, Holiday Spiced Orange Glazed Ham, Pomegranate Rosemary Sangria, and this cute little pup. 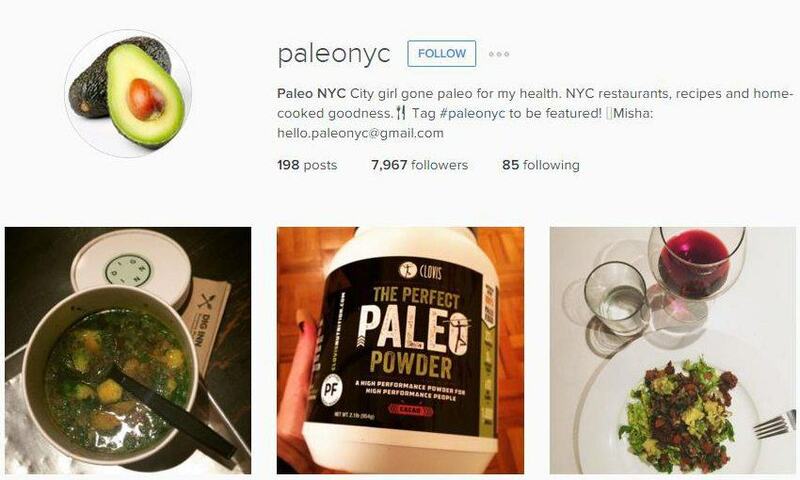 Paleo NYC is run by Misha, a New York City girl who has gone Paleo for the sake of her health. She’s clearly finding ways to make it work, judging from the gorgeous food shots that she posts! Some are her own, some are from fans, and some are from New York restaurants that she eats at. Wherever they’re from, we love them. We think you will too, especially: Niman Ranch Hanger Steak, Ultimate Pumpkin Pancakes, Guacamole with Sweet Potato Chips, and Pumpkin Carrot Muffins. 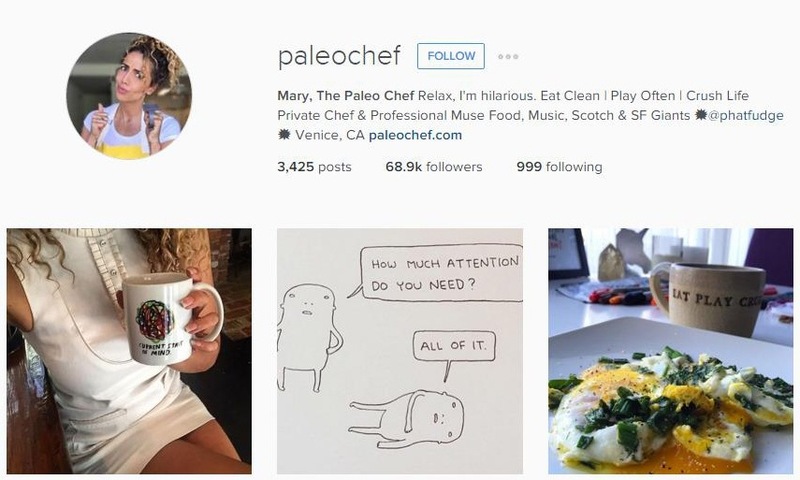 The Paleo Chef is run by Mary, who is, as you might have guessed, a Paleo chef. Mary believes in eating clean and having fun, which, as we all now know, can most definitely be done at the same time! The account has a cool, laid-back vibe that’s hard not to love (so say all of Mary’s 65,000+ followers), and includes food pics, selfies, and some really cute photos of a really cute dog. We love: Pan Roasted Pears and Kale, Almond Flour Chocolate Muffins, and Hard Boiled then Pan Fried Eggs in Ghee & Seasoning with Sautéed Kale and Onions. Paleo with Mrs P belongs to Emma, a recipe writer, food photographer, and general Paleo enthusiast. Mrs P’s Instagram account is the picture of clean living, full of images of impossibly attractive food and drink, and certainly a testament to her work as a food photographer. 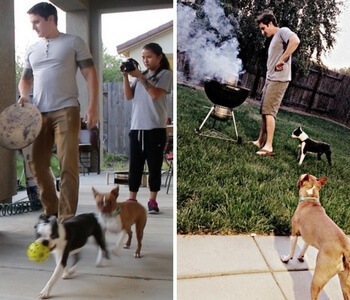 We’re really not sure which is more impressive – her picture-taking skills or her cooking skills. We’ll let you decide. Here are our favorites: Superfood Wraps with Scrambled Eggs and Tomatoes, Sweet Potato and Kale Rosti with Baked Eggs, Paleo Sunday Lunch, and Three Layer Double Chocolate Cups. 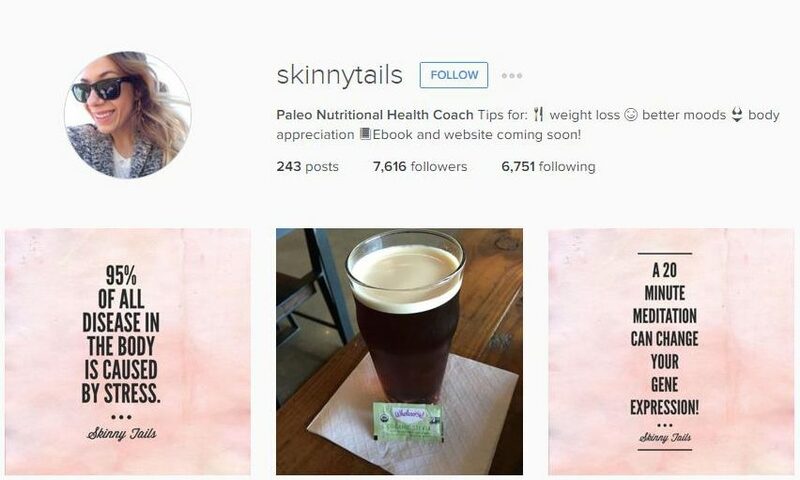 Skinny Tails is run by a Paleo Nutritional Health Coach in Texas, who wants to inspire you to let Paleo take you to ‘better moods’ and ‘body appreciation’. In fact, the account posts more inspirational quotes than it does food images, to help motivate followers to keep going. Does Skinny Tails focus a little more on the weight loss side of Paleo than others? Maybe. But, if you have plenty of recipes yet need a little pick-me-up, this might be the account for you. Our favorite quote posted on the account? It’s got to be: ‘Be your own passion project’. Absolutely. Got any more suggestions? Let us know below or leave us your Instagram and we'll publish it for others to follow as well!